There are a few reasons why I’m more excited than ever for Mixology Monday this month. First of all, I’m beside myself because our host is Jimmy Patrick, who is a fellow bartender and a good friend. Bartenders are a surprisingly rare breed in this little cocktail blogger community of ours, so he and I are often awash in a sea of pundits. Sometimes I need to write to Jimmy and ask, “How are we supposed to make 100 of those on a Friday night?”, or “What the heck are they talking about?” when something is too difficult for me to grasp either technically or intellectually. Jimmy also took over my duties when Dewar’s scotch called on my Mixology Monday and told me to pack my bags for a 10 AM flight to Manhattan the next morning. I love Jimmy Patrick. But I’m especially enthusiastic this month because Jimmy has chosen the theme of variations for his Mixology Monday. The idea really spoke to me, because it sums up exactly what I’ve been obsessing over for the past four weeks at my new job: the makeover of Bel Ami’s cocktail menu. Taking over an existing drink menu is a bit of a balancing act. While we didn’t want to alienate our customers and servers by jettisoning drinks that had been a part of their experience for many years, we felt that the cocktails needed a facelift. So in the end, we came up with variations of some of the house drinks as a way of introducing a bar program that focused on fresh ingredients, culinary technique, and classic proportions. I’ll illustrate this today with three cocktail case studies. The beautiful, expensive decanter of booze labeled “Ginger-Flavored Vodka” was like a bright red flag to me, and I knew that in order to set the tone of our new cocktail program, this would have to be the first drink to go. The biggest problem with the Yazi ginger vodka was that it didn’t taste like fresh ginger, which wasn’t going to work with our new plan. So to create something new while still offering a comparable experience, we presented the Gingered Honey Sour: Oregon’s Crater Lake vodka, freshly-grated ginger, honey syrup and fresh lemon juice. Shake ingredients over cracked ice and strain into an old-fashioned glass filled with ice. Garnish with a thin slice of fresh ginger. 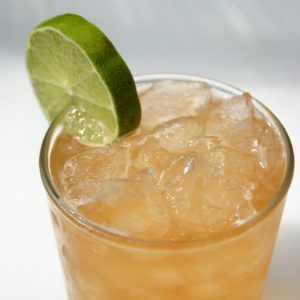 *To make ginger-honey syrup, peel and grate 1 ounce (by volume) fresh ginger. Add to 8 ounces honey and 8 ounces boiling water. Let steep for at least one hour, strain through cheesecloth, bottle and refrigerate. 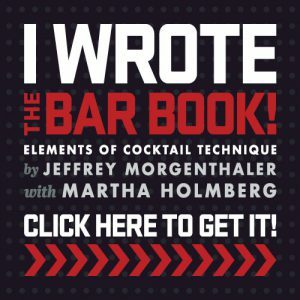 A tequila Cosmopolitan is like a raspberry Mojito: it’s a really unimaginative way to spice up what has already become a tired, pedestrian and often poorly-made cocktail. The Rude Cosmo tasted like it sounded: a well-tequila Cosmopolitan. To impart a more intense, fresher cranberry flavor we made a cranberry gastrique, which is a traditional French fruit-and-vinegar sauce commonly served with meats. We tried a number of tequilas with our gastrique, and settled on Sauza Hornitos for its sweetness and that unmistakable tropical fruit flavor on the palate. Adding some fresh lime juice back in to the cocktail rounded it out nicely. Shake ingredients over cracked ice and strain into a chilled cocktail glass. Garnish with lime. *To make cranberry gastrique, boil 1½ cups white vinegar with 1½ cups sugar, 10 oz fresh cranberries, the juice and zest of 1 lemon, 1 star anise and 4 cloves for 20 minutes, using a wooden spoon to help break up cranberries. Strain mixture through cheesecloth, bottle and refrigerate. Shaking Sazerac whiskey with a splash of well vermouth is a lot like shaking a baby: first there’s going to be a lot of foam, and then you’ll be staring death in the face. Finishing the job with a maraschino cherry is quite literally adding insult to injury. We updated the Manhattan by swapping the rye for a much bolder Rittenhouse 100-proof, bumped up the vermouth and switched to Carpano Antica Formula, added a dash of our housemade orange bitters, and finished the drink with a housemade brandied cherry. The name comes from the fact that the bar is located in the Midtown Marketplace. Stir first three ingredients gently with cracked ice and strain into a chilled cocktail glass. Finish with brandied cherry. *To make brandied cherries, strain a 16-ounce jar pitted cherries and reserve syrup. Reduce syrup by half in small saucepan. Allow to cool. Add ½ cup brandy and two tablespoons Maraschino liqueur to cherries along with reduced syrup. Refrigerate for one week before serving. So there you have it. Cocktail menus like the one I inherited can be found all over the country these days, but they’re never beyond repair. 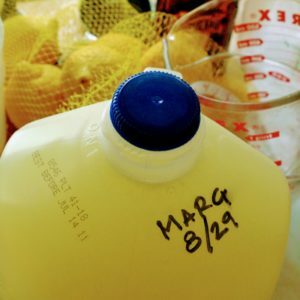 It just takes a few fresh and natural ingredients, simple culinary techniques, and some very basic mixological proportions to give a drink menu a makeover. Thanks for hosting, Jimmy. This was my favorite Mixology Monday so far. Your Midtown Manhattan is pretty much our house recipe in the wintertime… sometimes we use Bulliet, but the ratios and other bits are really close. Bravo! Your drinks a truly change the menu to a high quality bar! Cranberry gastrique? Now I really need to try this stuff. It is quite difficult to change “signature drinks” of a bar – to offer make overs is a very clever option. Them’s some fantastic looking drinks right there. The Flor de Baya has me wanting to ditch work for a morning eye-opener. Out of curiosity on the ginger front, have you had a chance to try the Canton ginger liqueur? Thanks, everyone! I look forward to reading all of your entries. Alex, I haven’t tried the Canton ginger liqueur, I don’t believe it’s been listed in Oregon. Living in a control state means I don’t always have access to a lot of the products bartenders living in other states do. Lovely. I’m so lucky to live in Eugene. Are these on the menu now, or still in development? It’s been too long since I’ve been to Bel Ami, and I’m looking forward to going back. I just started an affair with Carpano Antica, and am thrilled to see the Midtown Manhattan, especially. I’m no mixologist, and I feel shy to even suggest this, but I wonder if it might be fun to try muddling a wee slice of fresh ginger for the ginger-honey lemon sour, to add another layer of punchiness. All three drinks are currently gracing the cocktail menu at Bel Ami, so do stop in and try one! I don’t think that muddling the ginger would do much more than what’s already happening when I run it over a Microplaner in order to add it to the honey syrup. However, gently muddling a lemon peel or adding a dash of lemon bitters would definitely add another layer of punch. Great post! I’m quite surprised that you aren’t a fan of Yazi though. We must still have our original bottle (before they redesigned it to the more square version you have pictured) behind the bar. I don’t think I could give that stuff away. Gosh darn it, I forgot to mention the Angostura bitters in the recipe, we’re doing one of each. Even if the Manhattan with orange bitters is a Trilby, the customers will be mesmerized either way. Jeff, I’m going to quote you the next time a bartender shakes my Manhattan. Of course I won’t be going back to that bar after offending other patrons and freaking out the bartender. I think you guys did a really great job updating the drink menu. I was really impressed with the Gingered Honey Sour. The fresh ginger over the glass is simple but elegant and the aroma with every sip is genius. Having that strong aroma adds a dimension of ginger that is far more pleasant in my nose than I could have imagined. Your improvements to these drinks are fantastic. And, thank you again for experimenting with me. It made me really concentrate on the subtleties of each ingredient and how they interact with each other. Thanks again!!! Your Midtown Manhattan puts the shizzle on the mizzle! I’m glad you enjoyed the bourbon-cranberry gastrique concoction we came up with last night. I’ve always enjoyed bourbon with the flavor of cranberry. I guess we’ll have to revisit the matter in November! And, for the record, I have no idea what that means, either. Goshdarn it, I’m drooling like crazy for a Manhattan right now – specifically the one you list off. My previous brandied cherries were made by taking a batch of dried cherries and soaking them in brandy and a dash of Grand Marnier. Your way sounds much better. Do you have a preferred brand of cherries you use? I like to use Trader Joe’s Morello Cherries. They’re small and have a flavor similar to the real Maraska cherries. I just haven’t found anything that simulates the texture I’ve gotten from the Maraska cherries I’ve tried. Nice to see Carpano getting some use. It’s a fantastic vermouth, if a bit hard to find. Vya also works extremely well. I love the addition of orange bitters to the Manhattan. I’ve been using them in my Manhattans for quite some time now. Guess I’ll have to go home and make a gastrique to console myself. Next time, I’ll try more ginger and less honey. I’m sipping on a Midtown Manhattan right now, using the last two ounces of Rittenhouse I had. Gary Regan calls a Manhattan the greatest cocktail of all, but his version is too fuzzy: the big rye and the Antica Formula put this in the range of the Pan Galactic Gargleblaster, the greatest cocktail in the known universe. Great job on those drinks. You’re making me thristy at 9:00 am!! Keep in mind that while bartenders are (assumed) good at making drinks, they are not always good writers. And, blogging, above all is writing. Nicely done, Jeffrey. I especially like what you did with the vodka cocktails on the menu. As quite a few of us have bitched before, vodka is just not a spirit I’m inspired by. To appease the populist crowd, I just stick the Moscow Mule and the Vesper on there to give vodka some representation, but I’m thinking of challenging myself to come up with something utilizing classic technique with something refreshing and new. In any event, bravo on the revamp. Gotta get down to Eugene. Oh, whipped up some Richmond Gimlets the other night and they went over spectacularly. Cheers. Thanks, Keith! I’m trying to be more tolerant of vodka because, well, I live in a small town and that’s what people drink here. But if I can come up with something interesting and use vodka or gin as a “gateway” liquor, then all the better. I’m trying to get to Seattle to see all of you soon! I’m a big fan of the Flor de Baya at the bar so I was extremely excited to try to whip up a batch of gastrique for myself. Mine came out extremely thick (like jam) and I’m trying to figure out where I went wrong. I was supposed to boil it uncovered wasn’t I? Ack, I forgot to mention that the pan should be covered. Just add some hot water to your jam to thin it out to a syrupy consistency and give it a shot in a cocktail. If you haven’t dumped it by now, that is. Sorry for the comment-thread archaeology, but I need a drink for the spring issue of Edible Rhody. The remit: local and seasonal. 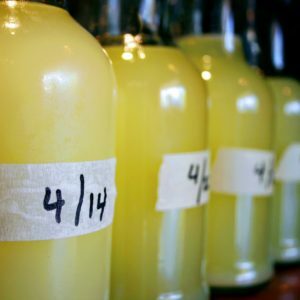 I love pairing tequila and rhubarb, and rhubarb’s seasonal to spring and locally available. But in the past I’ve used Fee’s rhubarb bitters, and for this I’ll need the fresh stuff. I was thinking already about a rhubarb syrup and came across your Flor de Baya linked on another site. Do you mind if I alter your recipe to a rhubarb gastrique? 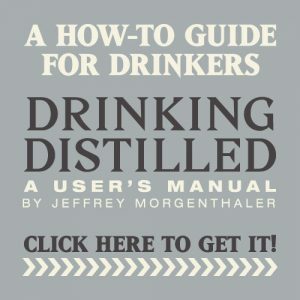 I’m aware that this post is nearly 3 years old but I just have to say that this one of the best things I’ve ever read in a cocktail blog: “Shaking Sazerac whiskey with a splash of well vermouth is a lot like shaking a baby: first there’s going to be a lot of foam, and then you’ll be staring death in the face.” I bow to you. Also, your recipe for cocktail cherries has served me well for about a year now. 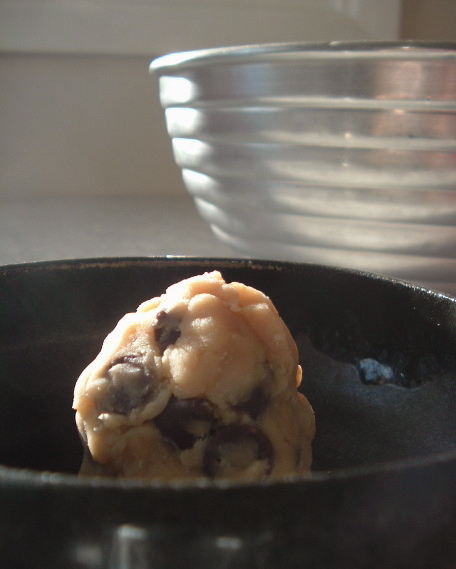 I use the jarred Morello cherries from Trader Joe’s and they work like a charm. Thanks for that.